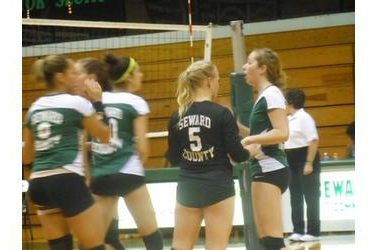 The Seward volleyball team didn’t dwell on a loss. Two nights after a 3-1 loss to Colby, the Saints handled Barton 3-0 (25-14, 25-19, 25-20) Wednesday night in the Green House. Thayna Silva led Seward with 12 kills and Carolina Gasparini added eight. Nacole Miller dished 19 assists and Kari Anderson picked up 15 digs. Seward has won six of their last seven and sits at 18-12 overall and 6-4 in the Jayhawk West. Seward is tied with Colby for third in the conference. The Saints host Garden City Wednesday night at 6:30 in the Green House.